LOS ANGELES – Former Los Angeles County Sheriff Lee Baca was sentenced Friday to three years in prison and one year of supervised release for obstructing a federal probe into corruption in the jails, with a judge lashing out at the longtime lawman and calling him an embarrassment to the profession. Baca, 74, was also ordered to pay a $7,500 fine. Baca’s attorneys had asked that he serve only home detention, and they have vowed to appeal his conviction. His attorney filed papers this week urging that the ex-sheriff be allowed to remain free pending arguments before the U.S. 9th Circuit Court of Appeals. U.S. District Judge Percy Anderson, however, ordered Baca to surrender to begin serving his prison term on July 25. Baca was convicted March 15 of obstruction of justice and two other federal charges for his role in the scheme to thwart the FBI probe into inmate mistreatment in the jails that he ran, and of lying to the FBI. 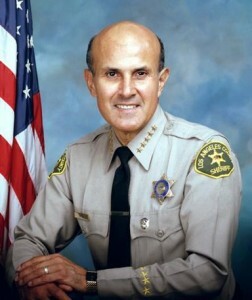 During his two trials, prosecutors described Baca as being the top figure in the conspiracy, which also involved his former right-hand man, Paul Tanaka, and eight deputies who took orders from the sheriff. Baca showed no emotion as Anderson handed down the sentence. At one point, he nodded at his wife, but Baca did not speak during the hearing. Prosecutors had asked for a two-year prison term, noting that they would ordinarily seek about four years, but took into account Baca’s age and diagnosis of being in the early stages of Alzheimer’s disease. During the sentencing hearing, however, Anderson lashed out at Baca and said if it hadn’t been for the ex-lawman’s health, Baca would have received the same five-year term given to his former second-in-command, Paul Tanaka. Speaking to reporters outside court, Baca thanked his wife, his attorneys and “the people of Los Angeles County,” saying he has continued to hear words of support from the public. “I would like to say that for me, it was an honor to serve the county of Los Angeles for over 48 years,” he said. In a pre-sentencing memorandum, prosecutors wrote that in helping derail the FBI probe, Baca “abused the great power the citizens of Los Angeles County had given him,” while false statements made during a sworn interview with investigators was a “deliberate attempt to deflect blame and place it entirely on the shoulders of others within his department,” the prosecution wrote in pre-sentencing documents. In its papers requesting a probationary term in home detention with community service, the defense cited Baca’s decades of public service, diagnosis of early stage Alzheimer’s disease and “peripheral” role in the wide-ranging conspiracy. Hochman spoke for nearly an hour during the sentencing hearing, asking that his client be spared prison time. But his request was sternly rejected. Baca — who ran the nation’s largest sheriff’s department for more than 15 years — was first tried in December on obstruction of justice and conspiracy to obstruct justice counts, and prosecutors had planned a second trial on the false statements count. But a mistrial was declared after jurors deadlocked 11-1 in favor of acquitting the former sheriff, and Anderson combined all three counts in the retrial. Baca did not take the stand in either trial. phone was discovered in the hands of an inmate at the Men’s Central Jail. Sheriff’s deputies quickly tied the phone to the FBI, which had been conducting a secret probe of brutality against inmates. At that point, sheriff’s officials closed ranks and began an attempt to halt the formerly covert investigation by concealing an inmate-turned-informant from federal prosecutors, who had issued a summons for his grand jury appearance. The charges involved a host of illegal acts, including a 2011 incident in which two sheriff’s investigators confronted an FBI agent in the driveway leading to her apartment and falsely told her they were in the process of obtaining a warrant for her arrest. Baca denied having advance knowledge of the illicit attempt to intimidate the federal agent. Prior to the first trial, Baca had pleaded guilty to the lying count, but subsequently backed out of a plea deal — which called for him to serve no more than six months in prison — after the judge rejected the agreement as too lenient. If Baca had not withdrawn from the plea, he could have been handed a sentence of five years behind bars. He was then indicted on the three felony counts for which he was subsequently convicted. In his argument for a non-custodial sentence, Hochman wrote that Baca’s condition would be best treated outside of prison. Baca became sheriff in December 1998 and won re-election on several occasions. He was poised to run again in 2014, but federal indictments unsealed in December 2013, related to excessive force in the jails and obstruction of that investigation, led Baca to retire the following month. in his request that Baca remain free pending appeal, Hochman argued that he is not likely to flee and poses no danger to the community. The defense attorney further wrote that his appeal is justified because the court erred in barring jurors from hearing evidence of Baca’s “cooperation” with both the federal probe and an independent county review board, and that the panel should have heard about the ex-sheriff’s Alzheimer’s diagnosis. Hochman also claimed the jury should have been allowed to consider evidence of improvements Baca made in the training of jail guards to de-escalate problems and successfully deal with violent and/or mentally ill inmates. Baca was not charged with any instances of jail brutality. 6 comments for "Baca sentenced to 3 years federal prison"
What about the inmates who were beat to DEATH in the county jail(s) that LEE BACA covered up??? He deserves way more than 3 yrs federal time. What a shmuck.! Rex gave a key to the city of Lancaster to Bacar a few years ago. Recently Rex gave a key to the city to Steven Frankland the head deputy for the AV branch of the DA’s office. Hmmmmmmmmmmmm. Ya don’t say! Coincidence, I’m sure! If Rex gives a key to the city, you know there are strings attached. He is as slimy as they come. DA Frankland was given the key to the city days after the major legal newspaper for California came out exposing his inhumane and unjust prosecutions and sentences in the AV. The paper is called The Daily Journal. It is hard to get because it is very expensive. But every major law firm gets it including every Public Defender’s office and District Attorneys office. It was a public defender in the AV who fought to get this story out so not all of them are dump trucks.